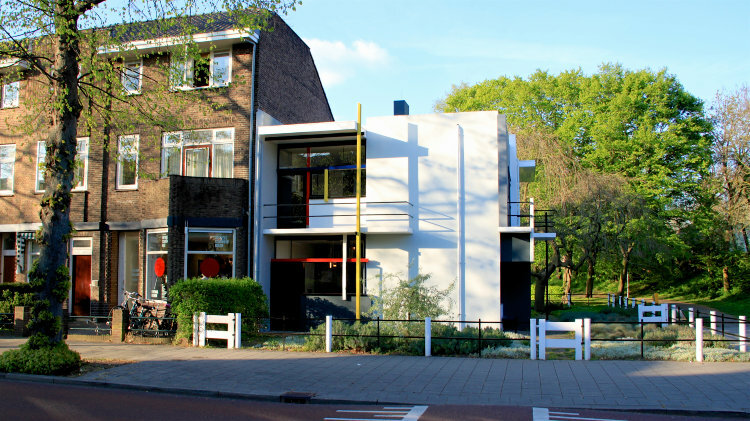 The UNESCO-listed Rietveld-Schröderhuis in Utrecht is the most-famous De Stijl house in the Netherlands. It may be visited only with prior reservations. The Rietveld-Schröder House in Utrecht is the best known building designed by Dutch architect and furniture designer Gerrit Rietveld. 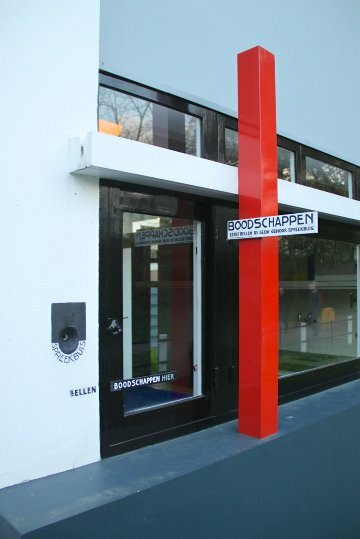 It is often described as the only building to fully incorporate the aspirations of the De Stijl art movement. The Rietveld-Schröderhuis is a Dutch national monument (Rijksmonument) and was inscribed on the UNESCO World Cultural Heritage list in 2000. The house is open to visitors but reservations are essential and may be made online through the Museum Centraal even months in advance. The Rietveld-Schröder House is arguably the most-famous architectural work by Dutch architect and furniture designer Gerrit Rietveld (1888-1964). (He also worked on the Van Gogh Museum in Amsterdam). 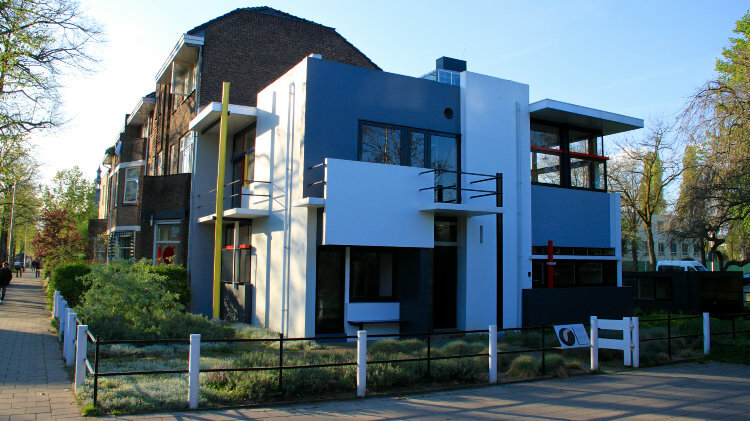 It was completed in 1924 and is considered the only house that fully followed the ideas of De Stijl art movement. Rietveld designed the house for Truus Schröder-Schräder, who had a major input in the final design. She lived in the house from 1925 until her death in 1985. Rietveld had his office in the house but only moved in with Schröder after the death of his own wife. 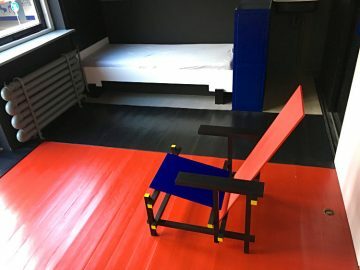 The Rietveld-Schröder House followed the principles of De Stijl such as ultra modern design with straight lines, primary colors, no unnecessary decorations, and an attempt to lessen the distinction between interior and exterior. Truus Schröder especially valued the open-plan space and “the luxury of frugality”. Rietveld and Schröder made no attempt to integrate the design to the neighboring building with which the house shares an outside wall. The exterior painted black, white, grey, red and yellow has nothing in common with neighboring brick houses – Rietveld even used a few tricks and errors to get the plan approved. 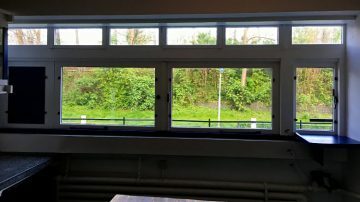 However, a few design features do give the age away: a special system to allow shopping deliveries (boodschappen) to be made through a window without requiring the homeowner to come downstairs. Similarly, a transparent mailbox made obvious from a distance whether mail had been delivered – at the time a few deliveries per day were possible. Also the balcony railings are not going to make it pass any modern planning committee. 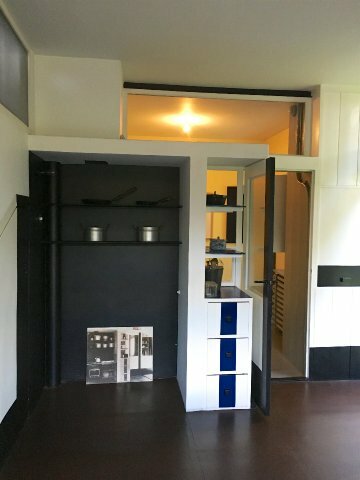 The ground floor of the Rietveld-Schröder House follows a fairly conventional three-rooms with a kitchen layout, although at the time of construction the lack of decorations and the built-in cupboards were already remarkable. The major interior design feature of the house is the upper floor: this was the main living area with an open space design that could be converted with moveable wall panels into three separate bedrooms and a living room area. The Rietveld-Schröder House looked away from the neighbors: originally over the meadows but urban sprawl caught up with the house. 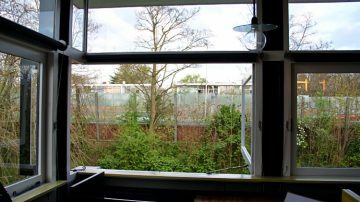 When the adjacent meadow was rezoned, Schröder bought the plot so Rietveld could design the apartment building so she could at least partly determine the new view from her living room window. However, they could not prevent a four-lane highway being built between the Rietveld-Schröder House and the new apartment building in Erasmuslaan. Rietveld wanted to tear the house down but Schröder ultimately accepted the situation and continued to live in her house until her death. 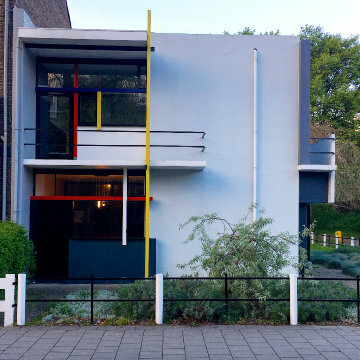 The Rietveld-Schröder House was declared a national monument (Rijksmonument) in 1976 but it was only after Truus Schröder’s death that Bertus Mulder restored the house to the original state of the mid-1920s. The house is furnished and decorated currently as it must have been when she moved in in 1925. 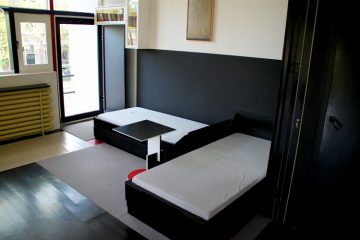 All the built-in furniture and correct colors are used. Rietveld designed the Zigzag Chair in the kitchen specifically for this house. Only two bookshelves in the girls’ room are later additions that Schröder ordered through an American catalogue. In 2000, the Rietveld-Schröder House was added to the UNESCO World Cultural Heritage list. It belongs to the Rietveld-Schröder House Foundation and is managed by the Centraal Museum of Utrecht. 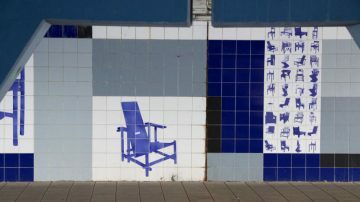 The Prins Hendriklaan viaduct underneath the highway is decorated with blue and white tiles showing some of the furniture designed by Gerrit Rietveld. Visiting the Rietveld-Schröder House is with an audio tour that starts at the hour. The audio guide is available in Dutch, English, German, French, Italian, Spanish, Japanese and Mandarin. Small groups of 12 proceed from the neighboring information center to the house with a guide that will demonstrate how the room dividers where used. Visitors may explore at their own pace with the visit inside the house taking around 45 minutes. Further information and videos are in the information center. Advance reservations are essential to visit the Rietveld-Schröder House, as only 12 visitors per hour are allowed into the house. Reservations are easily made online and are possible months in advance – a good idea as spaces book out fast during holiday periods and on weekends. Standard tickets are €15.50 while children 13 to 17, and a variety of student cardholders, pay €8 – the reservation fee is included in these prices. Children younger than 13, museumkaart and a several other cultural cardholders pay just the standard €3 reservation fee. The ticket also gives admission to the Centraal Museum on the same day. 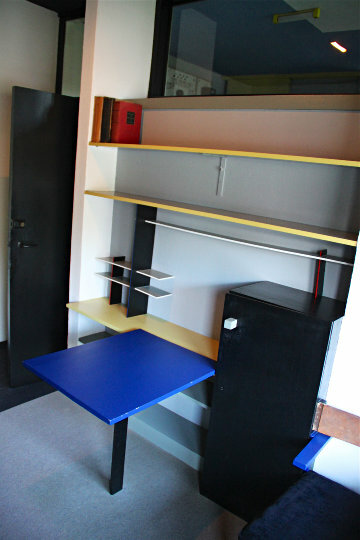 This local history museum in Utrecht has an eclectic collection that includes a very large collection of Rietveld furniture and other De Stijl works. The Rietveld-Schröder House is open Tuesday to Sunday from 11:00 to 17:00 and on Friday until 21:00. The last tour starts an hour before closing time. Top Tip: The Friday night opening hours are not currently listed on the English page of the museum but show up when trying to make reservations. The Rietveld-Schröderhuis, Prins Hendriklaan 50, 3583 EP Utrecht, is in the eastern parts of Utrecht and easily reached by car, bicycle and bus, or a leisurely stroll from downtown Utrecht. A good map is useful as there are not many signs. The closest highway exit to the Rietveld-Schröder House is Stadion Galgenwaard. Street side parking (charged) is readily available in Prins Hendriklaan and side streets. Cycling is of course an option. Visitors may borrow bicycles at the Centraal Museum as long as it can be returned by 16:45. The Rietveld-Schröder House is a pleasant 20-minute walk from the Centraal Museum or National Railway Museum (Het Spoorwegmuseum) at Maliebaan and at least half an hour from the Dom tower. See more photos on Flickr. The Rietveld-Schröder House also received mostly favorable rating from TripAdvisor users.